Ever since Star Wars: Episode IV - A New Hope hit theaters in May of 1977, fans have affectionately called Carrie Fisher's Leia Organa character "Princess Leia." It's been 32 years since we last saw Leia in Star Wars: Episode VI - Return of the Jedi, and while we've gotten brief glimpses at her in previously released footage and photos, there is still so much we don't know about this iconic character in Star Wars: The Force Awakens. As part of Entertaiment Weekly's extensive Star Wars coverage today, the site spoke with director J.J. Abrams, who revealed that Leia has a brand new title. "She's referred to as General. But, there's a moment in the movie where a character sort of slips and calls her 'Princess.' The stakes are pretty high in the story for her, so there's not much goofing around where Leia's concerned. But it felt historic to have her, especially with Harrison (Ford), back in scenes together. I can only imagine the baggage that they bring to it, I'm just a fan who loves this stuff, but they've been living with it - and living in it - since '77." We got our first glimpse of General Leia in a brief shot during the behind-the-scenes video that debuted at Comic Con this summer, and the final trailer also featured a shot of Leia embracing Harrison Ford's Han Solo. In both scenes, she's seen wearing what looks like an officer's uniform, but this is the first we've heard that she actually has a leadership role within the Resistence. When asked how Leia has been dealing with the pressure of her new position, Carrie Fisher had this to say. "Not easily. (She's) solitary. Under a lot of pressure. Committed as ever to her cause, but I would imagine feeling somewhat defeated, tired, and pissed." Without giving away any further details, J.J. Abrams teased that Leia's story is one of the "heavier" plot lines in the film. The director also spoke about the challenging nature of this shoot, which was delayed briefly after Harrison Ford was injured on set. The filmmaker revealed that, despite all of the adversity, it was a wonderful experience. "[The shoot] wasn't without incident; it wasn't without difficulty; it wasn't without tears shed and bones broken and things that could never have been anticipated happening. But with everything in the aggregate, it was a truly joyful experience, and I think that that has to do with the fact that people as funny as Carrie Fisher were simply there." 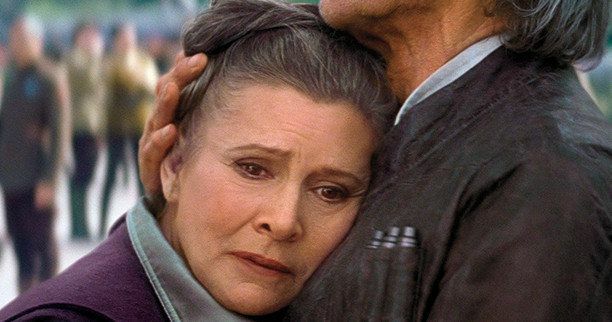 What do you think about Leia becoming a general in Star Wars: The Force Awakens? With just over one month left until this highly-anticipated film hits theaters, it isn't known how much more will be revealed about these iconic characters, or if we will ever get to see Luke Skywalker at any point before December 18. As always, stay tuned for more updates on Star Wars: The Force Awakens, as the countdown continues.